Uganda has agreed to take in tens of thousands of African migrants expelled from Israel in exchange for arms , a gag order lifted on Thursday revealed. A gag order is a legal order by a court or government, restricting information or comment from being made public, or in some cases, passed onto any unauthorized third party. Gag orders may be used, for example, to keep legitimate trade secrets of a company, to protect the integrity of ongoing police or military operations. According to the arrangement, Uganda will either accept the migrants, or serve as a transit station to their own countries. Israel’s Interior Minister Gideon Sa’ar said that Hagai Hadas, the prime minister’s special envoy, had obtained Uganda government’s consent, which was approved recently by Attorney General Yehuda Weinstein. However, Human rights groups in Israel say that the plan is in violation of UN policy. According to Israeli media, under the agreement in principle, Uganda will take 1,500-2,000 Eritreans currently in Israel in exchange for military, technological and agricultural aid. “In the first stage, we will focus on raising awareness within the population of infiltrators while helping them with the logistics of their departure, including costs, airfare and dealing with the possessions they accumulated while they were in Israel,” Sa’ar said. During the second stage, which will begin after the upcoming Jewish holidays, the state will set a deadline by which certain sectors within the “infiltrator population” will be asked to “willingly” leave the country. 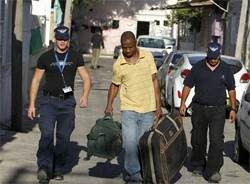 Over the past eight years, some 60,000 African migrants, mostly from Eritrea and Sudan, have entered Israel via Egypt. Around 2,000 are being held in a prison camp. They have applied for refugee status, but their requests have yet to be processed. Rising anti-African sentiments exploded into violence last year when a Tel Aviv protest turned ugly. Jewish rioters smashed African-run shops and property, and there was a worrying number of attacks against innocent Africans. Last year, it offered cash to the migrants to leave voluntarily. In June this year, the Israeli government decided to send thousands of African migrants to an undisclosed country in an attempt to stem the influx of migrants. That country now happens to be Uganda. However, this move drew criticism from rights groups in the middle east country with the Association for Civil Rights in Israel saying their rights must be protected. “In order to repatriate or resettle refugees or asylum seekers, there are certain standards that have to be met,” ACRI’s Marc Grey told reporters. “They have to go voluntarily to a third country,” he stressed. In a bid to stop African migrants from entering Israel, the country has erected a barrier along its border with Egypt. Prime Minister Benjamin Netanyahu has credited it for a dramatic fall in the numbers of people crossing from Egypt, with only two “infiltrators” entering this month. It is amazing to note refugees are traded for arms! if this is not human trafficing what else can it be? For those who treat Museveni as their errand boy, he is a democrat. He is a Champion. Come to think of it for a moment, he has been in power for over 25 years. According to some reports[v], Museveni has surrounded himself with many of his family members, many of whom hold senior positions in his administration. His brother, General Caleb Akandwanho is the Senior Presidential Advisor on Defence. His brother-in-law, Sam Kuteesa is the Foreign Affairs Minister. His wife, Janet, is a minister for Karamoja region and was promoted to the Cabinet. His daughter is the Private Secretary to the President. The Finance Under-Secretary is a cousin of the first lady. His Private Secretary for legal affairs is the nephew of his wife. Musevenis’s niece was reported to be working as secretary to Baroness Lynder Chalker’s office in the House of Lords in London. His son, who underwent military training in the UK and the US, is the Commander of Special Forces and was recently given the control of the elite presidential guard. The good President has an entire brigade protecting him from his own people. The opposition party is accusing the president of preparing his son to succeed him. Museveni feels no shame in creating this dynasty and turning the presidency to a monarchy. Like the proverbial frog in boiling water, he and others like him may not appreciate that the heat has been turned on until it is too late. No one, including his son, will be able to save him when his time comes. Museveni has done everything he could to secure his aid money and protection from the West by being a good boy, taking orders as well as giving out lands, invading neighbouring countries, sending his troops on so called ‘peace keeping’ missions, backstabbing African leaders, helping to impose sanctions against an African country, etc. President Museveni is the master of the art of puppetry and his accusing other African leaders of being puppets is a typical case of the pot calling the kettle black. He is the undisputed champion of puppets. For those who treat Museveni as their errand boy, he is a democrat. He is a Champion. Come to think of it for a moment, he has been in power for over 25 years. According to some reports[v], Museveni has surrounded himself with many of his family members, many of whom hold senior positions in his administration. His brother, General Caleb Akandwanho is the Senior Presidential Advisor on Defence. His brother-in-law, Sam Kuteesa is the Foreign Affairs Minister. His wife, Janet, is a minister for Karamoja region and was promoted to the Cabinet. His daughter is the Private Secretary to the President. The Finance Under-Secretary is a cousin of the first lady. His Private Secretary for legal affairs is the nephew of his wife. Musevenis’s niece was reported to be working as secretary to Baroness Lynder Chalker’s office in the House of Lords in London. His son, who underwent military training in the UK and the US, is the Commander of Special Forces and was recently given the control of the elite presidential guard. Museveni has done everything he could to secure his aid money and protection from the West by being a good boy, taking orders as well as giving out lands, invading neighbouring countries, sending his troops on so called ‘peace keeping’ missions, backstabbing African leaders, helping to impose sanctions against an African country, etc. President Museveni is the master of the art of puppetry and his accusing other African leaders of being puppets is a typical case of the pot calling the kettle black. He is the undisputed champion of puppets. Please accept my apologies for posting the quote twice. Debessay , Amazing article , thanks for sharing. I read the whole thing and so should all of our "opposition " groups and see what a real In-house Presidency looks like . Bartering refugees for arms? I didn't know this was allowed. I am sure if Eritrea had done this, they would have tripped all over themselves to try to pass a UN Resolution against it. How about using your own name like……Agame? I think it's WRONG to call him that. Afterall, Agame is just the name of a region. Instead, he should call himself what he really is: "DenQoro"! (Reuters) – The Ugandan government denied on Friday that it would accept African migrants deported from Israel after Israeli officials said they would soon send these people back to the African continent via Uganda. "We're not aware of any such deal. There's no way Uganda would enter such an arrangement," Foreign Ministry spokesman Elly Kamahungye said. Israeli officials said they would shortly start the process of deporting the Eritrean and Sudanese migrants, who number more than 50,000. Israel regards most of these Africans as illegal visitors crowding impoverished areas in search of jobs, and largely rejects the position of human rights groups that many fled their countries in search of political asylum. A statement late on Thursday from Interior Minister Gideon Sa'ar said Israel would soon begin a staged process of deporting the migrants after an agreement was reached with an African country other than Eritrea and Sudan to absorb them. No surprise here, I believe most of our African "Leaders " will sell their soul let alone accepting some refugees for arms . BUT there is another point which concerning. I was in Sudan when all this mad exodus began to Israel through Egypt and I can tell you 60-75 % of those migrants were Ethiopians & S. Sudanese nationals. Especially Ethiopians and Tigrians particularly were travelling under forged Eritrean Refugee IDs and traveled as such. So i suggest anyone reading an article take note of this fact. 1) Hard to make any sense of what u r saying. English 101 is need ASAP bro. Or write in the Language u r comfortable with like 1) Hard to make any sense of what u r saying . English 101 is definetly needed brother. 2) Suggest u check ur " big facts " as Ethiopia is the main source of refugees. Check Yemen, Sudan. Kenya, etc..
3) I can assure u that we might hear more about Eritreans but most refugees traveling to Libya and Israelare Ethiopians. Do u know every week over 500 refugees cross into Sudan from Ethiopia . 4) The poplulaation of Juba is around 250,000 so ur saying one fifth is Eriitrean ? Really ?